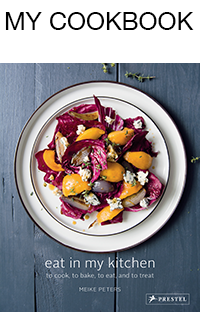 This salad is quite extraordinary in its combination but quick and easy to prepare. The first time I made it, I used dry beans which involved pre-soaking and cooking but I use tinned beans when I need a quick lunch like today. 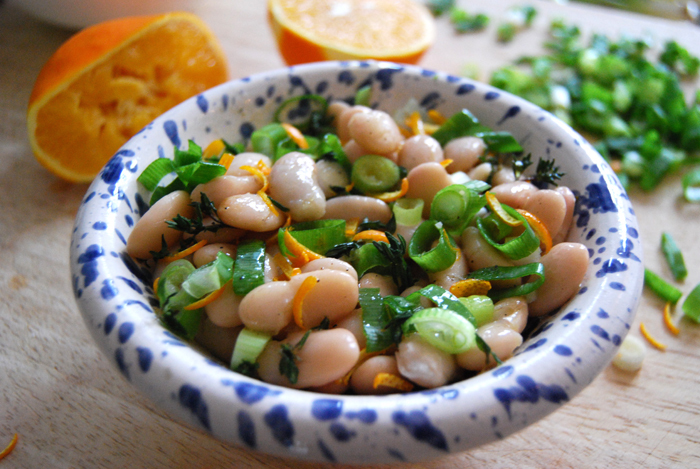 White beans are great to combine with other strong flavours and in this salad they still manage to stand out next to the strong tastes of orange peel, thyme and spring onions. They create a perfect match. For a lunch for two people you just need a big tin of white beans (rinsed), 1 orange, 4 spring onions, a sprig of thyme and salt and pepper. Maybe a few slices of bread to go with it and your lunch will be ready in a few minutes. 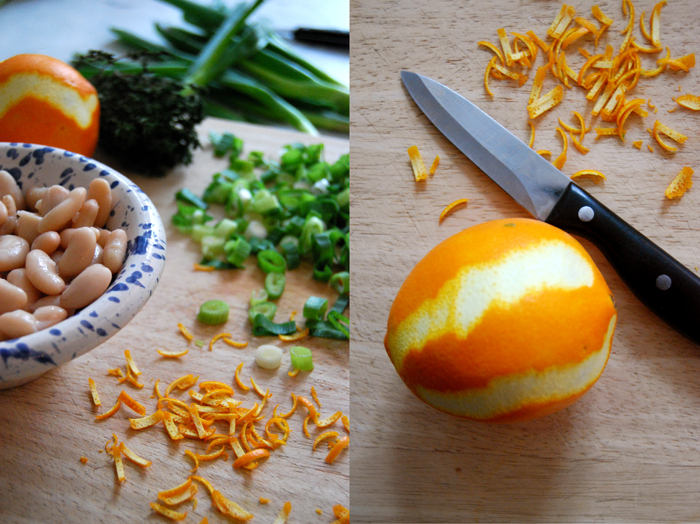 Cut fine strips of orange peel (I chop up four strips of peel, each 1x6cm / 1/2″x2 1/4″) and cut the spring onions thinly. Mix the beans with the leaves of the thyme sprig. For your sauce mix 3 tablespoons of olive oil together with 5 tablespoons of orange juice and season with salt and pepper. Mix everything together and you will have a beautiful lunch.